Child Support can be a thorny issue in divorce proceedings in the Family Court. Child support issues can lead to conflict that lasts for many years. Child support payments can be the largest single financial issue in a divorce proceeding. In Family Court proceedings an inappropriate or too generous child support award can impoverish the non-custodial parent. A fair resolution of this issue is crucial to the financial well-being of both parents and the children. If the burden on the parent providing support is too large, it can effect the ability of that parent to have a caring relationship with the children. The terms of your divorce or Family Court order involving the payment of child support may no longer deal with the reality of your present financial situation. Should you have a change in circumstances it may be necessary to bring a proceeding in either the Family Court or Supreme Court to obtain a new court order which represents a fair and reasonable amount of child support. Reasons for a reduction in child support payments may involve substantial change in income, the loss of your job or your being downsized to a lesser paying position. Issues may also arise with regard to your moving to a new location to maintain your employment. In a perfect world, you will be healthy for your entire life. However, should you become ill or disabled this is an additional basis for a reduction in child support. 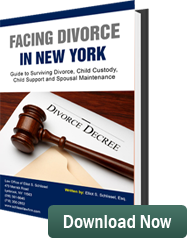 The law in New York requires the parent who the child does not live with to pay the parent that the child lives with child support. The purpose of child support is not to reward the custodial parent or to punish the paying parent. The sole purpose of child support is to provide financial security for the child. Child support in New York is payable until a child is twenty-one years of age or eighteen years of age if the child is emancipated. This is a long-term financial obligation that must be taken seriously. If there is a child support award, and you don’t pay it, you can be held in contempt and placed in jail. The courts take these obligations very seriously! The Child Support Standards Act (CSSA) is a federally mandated law that has been enacted in all 50 states. This law mandates that child support payments be paid on the following schedule by the non-custodial parent to the custodial parent. In addition to the aforementioned child support obligations, the non-custodial parent must contribute to child care expenses and may have to contribute to health care expenses. Contact us to discuss your case and our qualifications to represent you. Feel free to call toll free, any time, day or night, at 1-800-344-6431, or in Queens, Kings, New York, Richmond and the Bronx at 718-350-2802. You can also reach us in Nassau or Suffolk County at 516-561-6645. We welcome your inquires.